A cooling tower primarily uses latent heat of vaporization (evaporation) to cool process water. Minor additional cooling is provided by the air because of its temperature increase. Cooling tower selection and performance is based on water flow rate, water inlet temperature, water outlet temperature and ambient wet bulb temperature. Ambient wet bulb temperature and its affect on performance is the subject of this article. Ambient wet bulb temperature is a condition measured by a device called a psychrometer. A psychrometer places a thin film of water on the bulb of a thermometer that is twirled in the air. After about a minute, the thermometer will show a reduced temperature. The low point when no additional twirling reduces the temperature is called the wet bulb temperature. The measured wet bulb temperature is a function of relative humidity and ambient air temperature. Wet bulb temperature essentially measures how much water vapor the atmosphere can hold at current weather conditions. A lower wet bulb temperature means the air is drier and can hold more water vapor than it can at a higher wet bulb temperature. When selecting a cooling tower cell, the highest or the design wet bulb temperature your geographical area will encounter must be used. Highest wet bulb temperatures occur during the summer, when air temperatures and humidity are highest. Again by example, in Indianapolis, Indiana the design wet bulb temperature is 78°F. Historically Indianapolis can expect less than 1 hour per year that the conditions exceed a 78°F wet bulb. Typically 6,000 hours a year will have a wet bulb of 60°F or lower meaning that a cooling tower cell designed for a 78°F wet bulb will be able to make 65° - 67°F water for 6,000 hours per year ... nearly 70% of the year. Most cooling towers are capacity rated at a "standard" wet bulb temperature of 78°F. That means on the days when the wet bulb temperature is 78°F, the tower will produce its stated capacity. In other words, a tower rated to produce 135 tons of cooling will produce 135 tons of cooling at a 78°F wet bulb temperature. At a higher wet bulb temperature, the tower cell capacity decreases. Every location has a unique design (worst case) wet bulb temperature that is published by organizations such as ASHRAE and can be obtained easily. You can view Wet Bulb Temperatures for a listing of sample cities (opens new window : PDF file : 20K). So, what does it mean when your cooling tower water temperature is higher than the normal 5° - 7°F above the current wet bulb temperature? Due to improper water flow. Check for the efficiency losses described above. Replace the heat exchange surfaces with new clean fill. Check for proper air flow. Cooling tower performance is related to ambient wet bulb conditions. Higher wet bulb temperatures occur in the summer when higher ambient and relative humidity occurs. Initial system design and proper system maintenance is critical to be certain your cooling tower cell is providing proper cooling. Contact Advantage for application and design assistance for all of your process cooling needs. 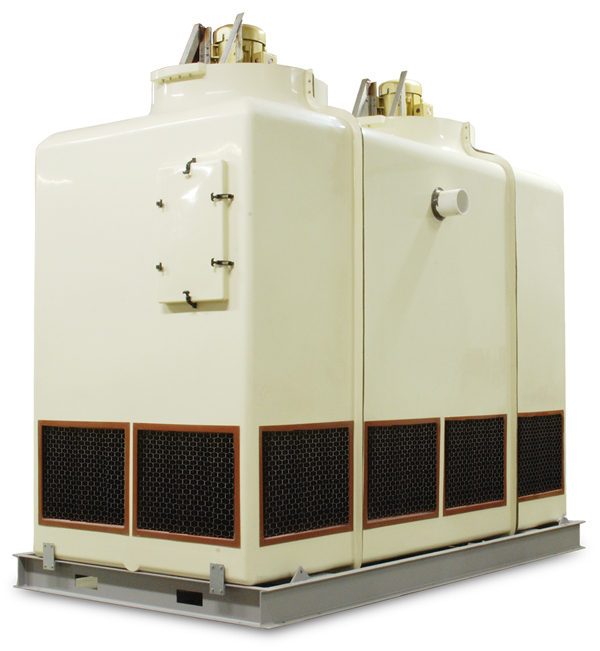 For more information about wet bulb temperature and cooling tower systems call the Advantage Sales Department at 317-887-0729. Would you like to Download FYI #273 to your browser?